Fry meat and onion together in hot oil until lightly brown, then add potato, carrot and 900 cc of water and cook in the pan for about 10 minutes or until the vegetables and meat are tender. Add the instant curry, simmer and stirring evenly. Ready to serve. Ingredients: Wheat Flour, Edible Oil (Butter Fat (Milk), Palm Oil), Curry Powder (8%), Salt, Sugar, Spice (Hot Pepper) (0.5%), Flavour Enhancers (E621, E627, E631). 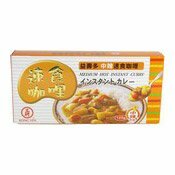 Simply enter your details below and we will send you an e-mail when “Medium Hot Instant Curry (工研中辣速食加哩)” is back in stock!